The online Yoga 4 Love advanced training path is a self directed year long life enhancement course. We are so enthusiastic about the complete personal engagement with you and the wonderful TRIBE of goddesses on the journey with you. You will easily develop a strong, personal relationship with your Tribe and your Director. You may or may not want to do this course for a certificate, many women join our Tribe for the personal growth, self care and accountability. You may choose to do this for something to give back to your Self or you may choose to go on to teach what you learned through this journey to others. TRIBE of goddesses from all over the globe. You may choose to meet up in person at the next Yoga 4 Your Inner Goddess Retreat in Texas or in Hawaii! You may choose your own personal Start Date! This program is designed to work seamlessly into your life! The dates to begin within this next class are listed in the EVENTS CALENDAR. Have questions? Want to know how this will fit into your life? Maybe you are ready to get started today? We want to meet you on a video chat or call! Set up a mini interview with Director! Work module by module at your OWN PACE through the track of your choice. Graduation Online or at the next Retreat! Upgrade to the Yoga 4 Love Hawaii Adventure Yoga Retreat on the Big Island of Hawaii. 7/1, 7/15, 7/30, 8/1 or 8/15 for Graduation Summer 2019!!! Lisa is the Founder of Yoga4Love.com and is the Executive Director of Yoga 4 Love Advanced Training Programs Online 200 /300 Hour + Retreats. The location, Yoga 4 Love Studio Cabin, is on sacred land on a rural property in North Texas with a beautiful waterfall, just 25 minutes south of downtown Dallas, Texas. Lisa specializes in teaching Intuitive Vinyasa, Reiki Energy, Coaching, Shamanic Work, Detox + Nutrition. 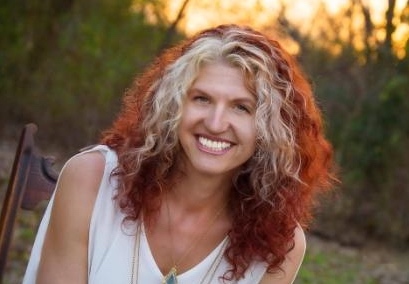 She is a seasoned speaker, emcee, host and presenter for many Texas and national yoga community events including the DFW Free Day of Yoga, the Holistic Festival of Life and Wellness and The Cosmic Yoga Fest. E-RYT 500~ Experienced Yoga Teacher with over 500 hours of mastery training; Lisa has taught over 8000 hours.